Reminder: I try to practice the methods described in “Getting Things Done: The Art of Stress-Free Productivity” by David Allen. The end result is that I add a due date to almost everything in my Wunderlist so that I can stare at the “Today” smart list instead of into my own mind. The other result is that a lot of my recurring events will go red (i.e., late) and stay red for great lengths of time. I think you’ve gone numb to a few areas in your task manager. The edges of your system are fuzzy from missing proper categorization, and you have too many items scheduled to be completed each day. If you ignore the red text (time-sensitive to-dos), the system breaks down from lack of trust, and reduce the chances that you’ll take those to-dos seriously. Don’t set unnecessary due dates on to-dos. David Allen suggests using your calendar for items due on a certain days. I use my calendar for timed events and informational items (a.k.a. FYI), but I’m cool with due dates in my task manager, Things, where to-dos or projects appear in red on the day they need to be completed. Sort the to-dos into lists when you determine where they belong, rather than staying there indefinitely. If a to-do isn’t in a list, I feel it has less importance because I haven’t fully determined how and why it needs to be done. Add tags (context) to to-dos in your Inbox. Tags allow you to reduce the number of displayed items appropriate to your current context. 07:30 — I’m inspired to write! I’ll view the “write” tag. 11:45 — I have 15 minutes at work before heading out to lunch. In the Automattic list, view the “15m” tag. 16:00 — I’m tired. I’ll wind down by catching up on reading P2s threads by viewing to-dos with the “read” tag in the Automattic list. 20:30 — Are there five or six quick to-dos around home I can complete within the next 30 minutes? View the Home list, then search for the “5m”, “10m”, “15m”, or “30m” tags. For instance, learning to draw is a hobby right now. I want to do a little bit everyday, but it’s much lower priority than finishing my work tasks or chores at home. So it hasn’t happened in almost a week. Is it a priority, would you like for it to be a priority, or will it be a priority at a later date? This is a great exercise, as I sometimes find myself inadvertently embracing guilt, rather than punting something to my Someday list, or scheduling the to-do to resurface on a later date. Add context to items that have gone stale. Add subtasks to stalled to-dos. Don’t forget to add tags to those subtasks. Punt items to a Someday list. Great titles for your to-dos make a big difference. […] Be crystal-clear about the real action you’re going to take, so that when you see the to-do again later you won’t have to think twice about what you meant. Mowing the yard is important, but I hate doing it and I’m only willing to bother under the right weather conditions and time. So it will probably stay red all the way up until there’s a jungle in my back yard. Let’s apply some a couple minutes of thought to the to-do “Mow the Yard” as an exercise. Do you need to prepare anything before you can start mowing the yard? If yes, add subtasks. How much time will it take? Add tags! At what point do you declare to-do bankruptcy to get rid of all this to-do debt? I don’t; that’d entail nuking the whole system and starting from scratch. Instead, I employ the above techniques to renegotiate my agreements to eliminate any guilt. I can work very hard all day, cross lots of items off my list, and still feel like I’m not getting traction. Traction on what? Try adjusting your Smart Lists so Completed is visible, and review it daily for a confidence boost — or reality check if you’re doing to-dos that aren’t relative to your goals. The end result is that I add a due date to almost everything in my Wunderlist so that I can stare at the “Today” smart list instead of into my own mind. 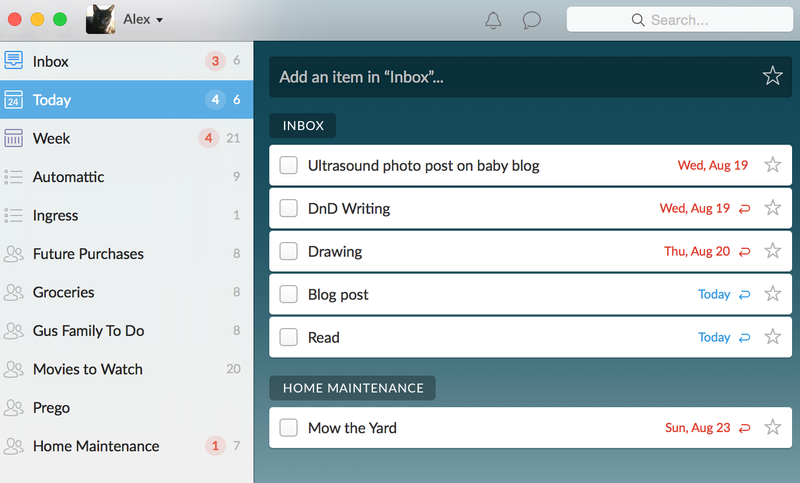 You already have a full to-do list in Wunderlist (and your calendar). Both are technically groups of organized sublists in various designs and layouts. Review both when you have discretionary time, then work off those tasks. Limit your Today smart list for to-dos that need to be done today. Pat yourself on the back! Review your Completed smart list regularly. Allow yourself to “punt” items to a later date, into your Someday list, or into the trash. Thanks for the prompt, Alex!